Recently I uncovered this video Chow.com did with Nach Waxman, owner of Kitchen Arts and Letters. During the interview, Waxman talked about one of his fears that was cooking would be lost due to people heavy reliance on cookbook. He exclaimed that “cookbooks don’t have to do anything, you have to do it”. I agreed with him. Though I am the proud owner of many cookbooks, I cannot remember a time where I strictly follow a recipe. Even for baking where precision is key, I would always make adjustment here and there. To me, the purpose of cookbooks is to discover and understand flavour combination and to inspire my next meal or dessert. This carrot and pumpkin soup evolved from what was in my refrigerator. These days, I tend to cook what I can find – it is almost like the mystery box challenge in Masterchef and Chopped. The truth is with a bit of creativity, logic (a lost art form) and motivation, it is possible to make a decent, if not, a delicious dish from what’s in your fridge (unless your fridge is stock full of jars of condiment and no produce). I created this soup without the use of measuring cup or scale. It was just based on my understanding of flavour, watching enough cooking show and most importantly taste. The end product was a rich, delicious, winey soup. While I cannot give you the precise measurements, I can however list down the ingredients I used. If you are missing any ingredients, be brave, switch things around and go with the flow. This serves roughly two people. Or one very very hungry person. - Start off with a mirepoix – onion, celery and carrots – sautéed with a bit of olive oil in a big pot (the pot must be able to hold at least 1.5 litres of liquid). Stir the mirepoix occasionally. - Once the onion turned transparent (not brown) and the rest of the vegetables has somewhat softened, throw in the diced pumpkin (I used Japanese pumpkin, you can go ahead and use butternut squash and so on). Cook for another 5 minutes. - Add in any leftover vegetable stock (I used instant stock; you can use chicken stock, or even water). Simmered for about half an hour (or till all the vegetables have turned really soft (You should be able to pierce through either the carrot or pumpkin with a knife). 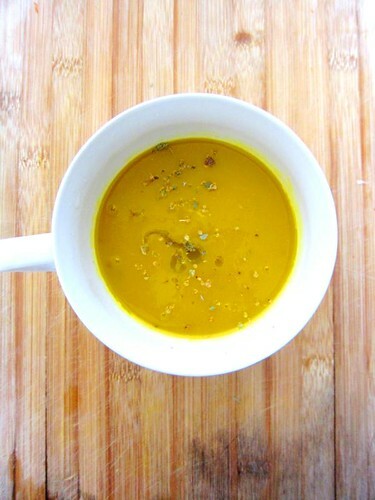 - Pureed the soup via the immersion blender or the blender machine. - Once the soup is pureed, taste and flavour the soup accordingly. In my case, I put in a splash of mirin (for sweetness) and Worcestershire sauce (for saltiness), and a very generous glug of cooking sake. - If you do not like or don’t have mirin or sake, you can also add in salt and black pepper (and white wine). Always start with small quantity, taste and then add more. - To finish, a small drizzle of extra virgin olive oil and a sprinkle of herbs and Korean chilli powder (Gochutgaru) for some heat.